This affordable stylish atomic clock has the same split-second accuracy as our other ExactSet clocks. The built-in antenna receives signals from the US Atomic Clock, the most accurate time clock in the world. 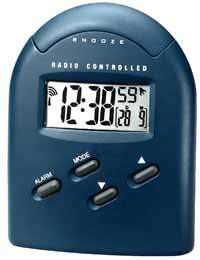 It has two alarms, a time/day/date display and a low battery indicator. The alarm has an 8 minute snooze. Actual size: 3.6" x 2.0" x 4.5"